What follows is a partial transcript of a framed article hanging inside the church. “Reviving Dark Forces” was written by Mark Hume and published in the Vancouver Sun, Saturday, May 25, 1991. The shrine includes 60 carved human figures, 25 human skulls and two wooden whales. Native legend says the prayers and rituals practised by shamans gave hunters the magic they needed to find whales; it also made the sea send dead whales to the beaches around Nootka Sound. 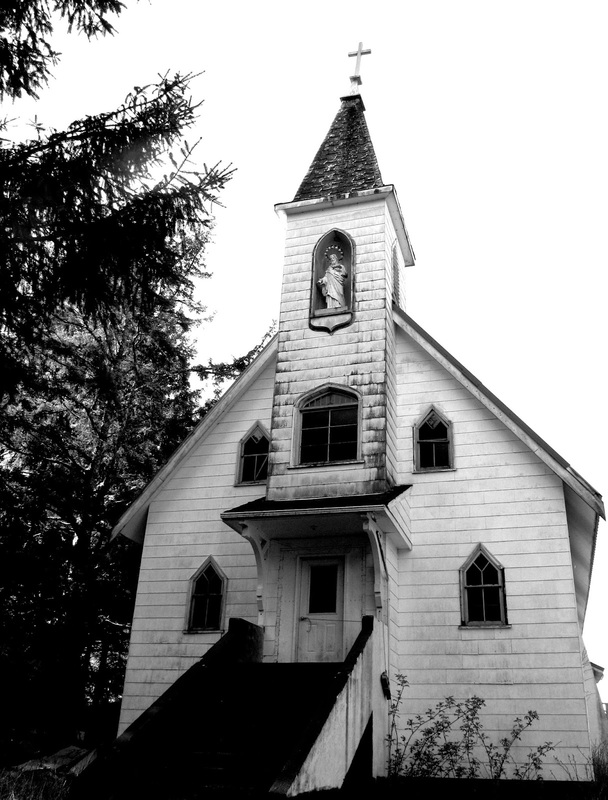 The people of Nootka Island who used the shrine believe it still has that power. One of the native concerns now under discussion is whether such dark forces should ever be brought into the open again. “It’s incredibly powerful stuff,” says Inglis of the magic attributed to the shrine. The shrine, a magic house that was considered “a great treasure” of the Nootka people, was in continual use for 300 years before it was collected by the American Museum in 1904. Generations of Nootka whalers performed rituals at the shrine which at times drew its black magic from human sacrifice and grave robbing. Inglis, who has been researching the monument for several years, says the native community has mixed emotions about the shrine. Some want it returned to Yuquot, to be shown in a museum or cultural centre. Others think it should never be put on public display again. European mariners turned whale hunting into a deadly, highly mechanized science that brought world populations to the verge of extinction. But in the native world, during the shrine’s centuries of power, killing whales was a dangerous job that required the help of spirits. Anthropologists say the Nootka developed the most spectacular sea hunting techniques on the entire Pacific coast. Travelling in large, ocean-going canoes, they killed whales with harpoons that had cutting heads made of mussel shells; sealskin buoys were connected to long lines made from animal sinew. The techniques for hunting—and the magic—were cherished family secrets passed down from chiefs to their sons. In addition to the hunters, the Nootka had whale-ritualists, shamans so powerful it was said they didn’t have to hunt whales at sea, but magically drew to shore those that had died from natural causes. Tsaxwasap,a man with great shamanistic powers, was one of those who first used the shrine. He intensified the power of the magic house by bringing dead bodies to it, and live infants stolen from their mothers. When Tsaxwasap inherited the shrine it had only four human skulls. In her book, From the Land of the Totem Poles, Aldona Jonaltis, of the American Museum, says Tsaxwasap kidnapped infants and robbed graves to build the shrine’s power. The shrine, which dates back to 1700 and could be much older, was used by at least eight generations of whale ritualists. After the third generation of use, wooden figures were substituted for human skeletons. There were only 14 skulls at the site when it was collected in 1904. The wooden figures appear in the photograph above. I suspect the 25 human skulls may be all that remains of the crew of The Boston, killed by Maquinna's warriors in 1803, but who knows? Friendly Cove was once the most important point of anchorage on the Northwest Coast. As far as I know, the items in question are still housed in the American Museum. An article in the Vancouver Sun, April 2013, states that the museum has tentatively agreed to repatriate the shrine. One challenge is financial; moreover, what should the community do with the shrine once it is returned? This is a complex issue. The Nuu-chah-nulth people hope to build a Cultural Centre here, but to do so takes a great deal of money. Also, the cove is only accessible by boat or floatplane. Still, it makes no sense to me that this powerful, sacred treasure should be crammed in the basement of a New York museum. What do you think? Interesting piece. I remember speaking to a man who showed me his grandfather's harpoon with notches on it representing the number of whales that had come to him in order to give it's life so that other could live. My sense is the relationship amongst hunter, community and hunted was based on a form of enlightened benevolence and sacrifice. Yes, I agree. It was not a case of senseless slaughter. My understanding is that the whale hunt was a sacred experience. There is a lake here, I have yet to visit, where the hunters went to bathe before the hunt--purification was an essential component of the ritual, and the "shrine" factored into that preparation.